Landscape photography often revolves around evoking emotions and portraying the depth in the scene. We always try to bring in concepts of leading lines, elements, etc to show the depth of an image. 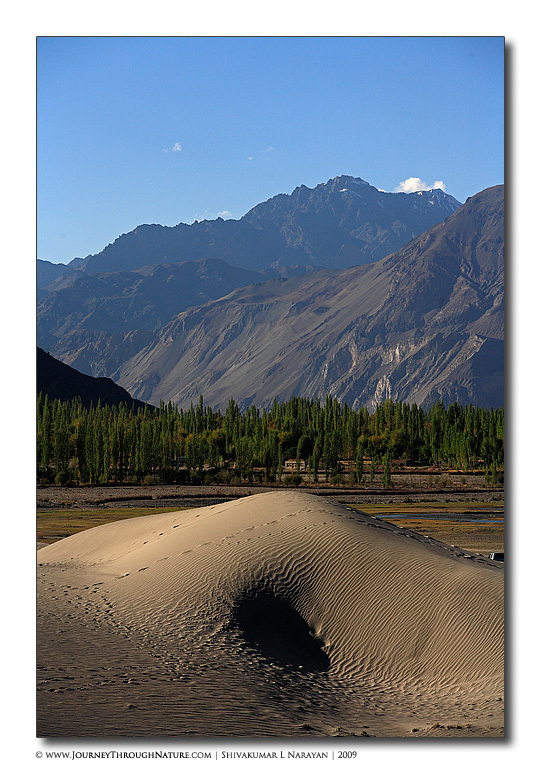 One new thing which stuck into my mind during photographing in Nubra region of Ladakh (Nubra is a high altitude desert with rare precipitation and scant vegetation except along river beds), is the ability to use the idea of layers, scale and variety to show the depth in an image. Ladakh is formed of varying landscapes – everything varying from snow-capped mountains to dry rocky hills to thick thorny shrubby region to sliver sand-dunes! In this image the combination of sand-dunes, trees and the gigantic mountains are presented in a ‘sandwiched’ composition to depict a sense of depth and variety in the image.